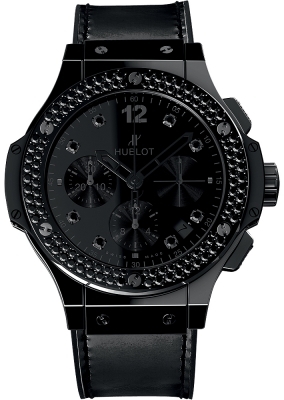 Big Bang ALL BLACK Shiny. 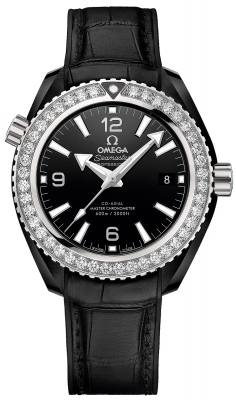 Bezel set with two rows of black-diamonds, for a total of 114 diamonds weighing +/- 1.18 carats. Crown & chronograph buttons with black rubber centers/inserts. Hour markers: 8 applied black diamond hour markers, the 12 o'clock marker is polished & black PVD coated applied stainless Arabic Numbers & small polished & black PVD coated applied stainless indexes at the 3, 6 & 9 o'clock position. Polished & black PVD coated applied stainless skeletonized hands. 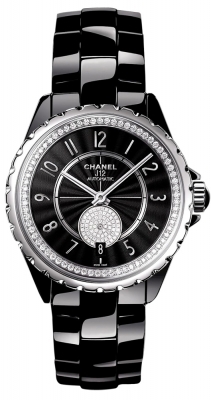 Black printed minute track with 5 minute Arabic numerals intervals on the outer perimeter of the dial.